See the Category: 120 film for a list of cameras using this film. 120 film is a film format for still photography introduced by Kodak for its Brownie No. 2 in 1901 (although the numerical designation 120 came later). Among rollfilm sizes, 120 has had survived the longest, and currently defines "medium format" as it it known today. Its specifications are defined by ISO 732; most recently (as of 2006), by ISO 732:2000. Because of popular awareness of 35mm film, a common blunder is to use the term "120mm film." While 120 is indeed "bigger than 35," the width of 120 film is actually ~61mm. This is rounded off to "6" (centimeters) when referring to the image formats used by 120-film cameras, such as 6×7 or 6×4.5. In Japan, 120 film was normally called "Brownie film" (ブローニーフィルム; Burōnī firumu) film until about the 1950s, because it was associated with the Brownie camera. Thus the Bronica, named after the film size, is indirectly named after the Brownie. At the same time, the 6×4.5 format was called Semi (セミ; Semi) and the 6×6 format was called Six (シックス; Shikkusu). Some older German 120 cameras (or those sold by Ansco) may use the designation B2, but this size is equivalent to 120. A120 or Autographic 120 film was produced by Eastman Kodak from 1924 to 1934. 120 is the best known roll film format. 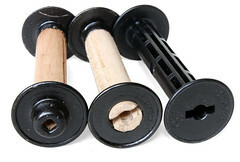 The spool was originally made of wood with metal flanges, later all metal, and finally plastic. The film strip is fixed to the backing paper at its leading end but is free at the other. The paper strip is much longer than the film strip. Thus the film is always wrapped light tight in paper before insertion into a camera or film back, and also after removal for development. The backing paper is black, or at least one side of it is blackened to render it completely opaque. In most designs until the 1950s, as well as cheaper cameras to the present day, a red window in the camera back is used for exposure counting (via a hole in the film pressure plate). Frame numbers on a roll of Ilford XP2. 6×4.5 numbers are at top, then 6×6 and 6×9. 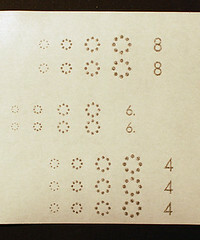 Frame numbers for the main frame formats (4.5×6, 6×6, 6×9) are printed on the back of the backing paper. The three series of numbers did not appear on the backing paper of the earliest roll films: at the beginning only the '1' to '8' numbers for 6×9 format were present, and this explains why the very first Rolleiflex models used not 120 but 117 film, specifically designed for 6×6, and why the first 4.5×6 cameras like the Ikonta A had two red windows to control the film advance, using each of the numbers for 6×9 twice. A select few cameras like the Fujifilm GA645 from the 1990's had a bar code reader on the back and the ability to automatically set the ISO based on the printed code on the backing paper. The photographer loads the film into the camera, attaches the leader of the new film into the take-up spool from the old, winds on to check it's working, then closes the back and winds on until the film start marks can be seen through the window. For every frame thereafter the photographer simply winds until the next number is visible. Cameras for non-standard formats (such as 6×7 or 6×17), as well as newer or more expensive standard-format cameras must use a different counting system. Most commonly, the photographer loads the film then winds manually until a bar or arrow on the paper is aligned with a mark on the film guides. The back is then closed, and thereafter the camera "knows" how far to wind for the next frame, through the use of mechanical rollers etc. which measure the amount of film which passes. People accustomed to the regularity of 35mm winding may at first be confused that 120 film seems to require less winding as consecutive frames are exposed: this results from the effective increase of the diameter of the take-up spool as more film and backing paper are wound onto it. When taken out of the camera the film is kept coiled up by fixing it with a little adhesive strip provided by the factory. Film advance of 120 film is always unidirectional: the original spool of a film roll always becomes the take-up spool for the next film roll. Unlike cameras for 135 film, those for 120 film show a variety of directions for winding. 120 film is designed to accommodate several different image sizes; but the one encountered most frequently would probably be 6×6 cm (more exactly 56×56 mm) square. This is sometimes referred to as "2¼ square" format by those who think in inches. Image sizes nominally 6×9 cm and 6×4.5 cm (a.k.a. 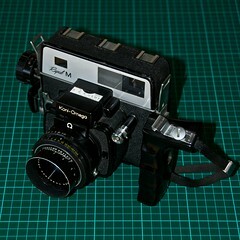 "semi" format) are also standard, the former being the original format for 120 and the one associated with many Kodak cameras. Additionally 6×7 cm, and less commonly, 6×8 cm and 6×10 cm are used by some cameras. Special-purpose panoramic cameras even produce 6×12, 6×17 cm, or even wider frames. Like "6×6", all sizes are nominal; actual dimensions are a bit smaller. One advantage claimed for 6×7 and 6×4.5 sizes is that they enlarge almost exactly (without cropping) onto 8×10" paper, and thus proponents call these ideal format cameras. Among all the image sizes for 120 film, naturally the smallest "645" format permits the lightest and most compact cameras. Though uncommon, half length 36 cm 120 films were also offered in the past with four exposures for 6×9, five for 6×7, six for 6×6 and eight for 6×4.5. 220 film, introduced in 1965, is the same width as 120, but with double length (144 cm) and thus twice the number of exposures per roll. ISO 732 also specifies the dimensions of 220 film. Unlike 120, there is no backing paper behind the film itself, just a leader and a trailer. This allows a longer film on the same spool, but as a result there are no printed frame numbers for old cameras that have red window as frame indicator. (Moreover, light from the window would fog the film.) Also, since the film alone is thinner than a film with a backing paper, a differently positioned pressure plate may be required to achieve optimal focus. Some cameras capable of using both 120 and 220 film will have a two-position adjustment of the pressure plate (as well as a switch elsewhere to adjust winding), while others will require different film backs. There is only a small choice of 220 film now (2009) available; for example, there is only one kind of black and white film (from Kodak). The great majority of cameras for 220 film also take 120 film, but at least one model of Linhof and one model of Yashica Mat only takes 220. The cameras designed to use 620 film usually cannot take 120 film — although there are exceptions that take both, such as the Ilford Envoy. Many of the 620 were made by Kodak (which, after its introduction, made few models for 120). 620 film was discontinued in 1995, but some photographers respool 120 film on 620 spools in the darkroom to use their 620 cameras. 105 film, introduced by Kodak in 1898 for its first folding camera, was the original 6×9 cm format roll film. 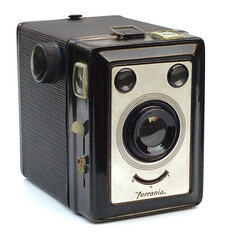 117 film, introduced by Kodak in 1900 for its first Brownie camera, was 6×6 cm format. 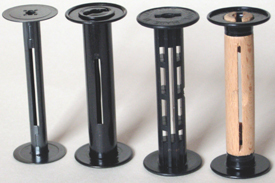 These formats used the same width film as the 120, but with slightly different spools and backing paper. Rajar was a brand name of British company APeM. Rajar No. 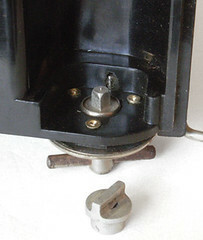 6 film was a 6cm roll film similar to 120, but on a spool with a square drive slot, made around the 1920s. Many cameras made for this film were converted by adding an adaptor to fit the end of 120 spools. 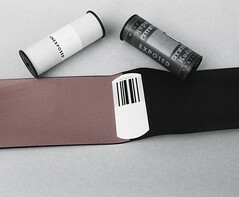 "120 film" (1 February 2006 version of Wikipedia article). This page was last edited on 15 April 2019, at 21:15.